To the family he was known as Henry, he was always keen to talk about the cricket, tennis and the good times from the past, he was however quite tight-lipped (as many diggers are) about the bad times of war. For the time I knew him, I was too young to appreciate just how special he was. It would have be a joy for Henry to be here now and to have a good ol’ chat. When I first read this article, I found out things I never knew about Henry… he was then and still is an inspiring spirit. Of all the remarkable men who came to light during the 50th anniversary of the Sydney Harbour Bridge the mist remarkable would have to be Harry Tomrop. Tom to his mates, he is the last known survivor of the “Tin Hares”, the 12 steel erectors who built the Bridge. 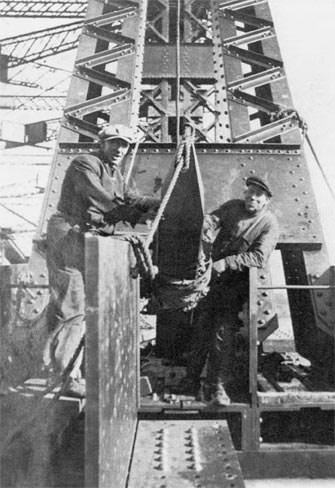 Of course they had the help of nearly 1,000 men in England and 2,000 in Australia, but they, with the two crane drivers, positioned every piece of steel. Tom was born Ernest Henry Tomrop, on a sailing ship in Russia in 1891. His American mother died at his birth. His Russian father was the ship’s skipper and Tom grew up serving his time “before the mast” in sail and steam. Running from his father’s harsh disipline, he became an able seaman at 15, and jumped a German ship in Adelaide in 1910, at the age of 20. He joined the Ironworkers’ Union and worked as a rigger for Simpson & Son, getting his naturalisation papers in 1912. Tom next moved to Melbourne, working as a steel erector until the outbreak of World War I, when he enlisted in the Navy straight away. He found himself on land in Egypt and Palestine with the Royal Australian Naval Bridging Train, rebuilding railway bridges smashed by the Turks. This bunch of wild riggers was disbanded in 1917 when their job was done. They were given the option of returning to Australia, or of joining any unit of their choice. Tom chose the Australian Flying Corps. In those early days of aviation, planes were made of wood and canvas and wire, and good riggers were much in demand. After the War Tom signed on in the RAAF for six years, becoming a regging instructor at Point Cook; but the peace-time discipline irked him, and he bought himself out after four years. Tom went back to sea, first to Europe with wheat, the New Mexico and Florida in the USA. Jumping ship again, he worked erecting oil tanks, with sheerlegs and horses to lift the steel plates. With money in his pocket he headed for New York, to find his elder brother, who he had never known. In the Air Force Tom had got his engine and airframe maintenance tickets, and he quickly found a job at the Atlantic Aircraft Company in Tettleboro; New Jersey, where he worked on the planes for Admril Byrd, the artic explorer. Having found his brother he moved back to New York, erecting sky-scrapers there, until, homesick for Australia, he got work on a timber ship bound for Melbourne with a load or oregon. He moved up to Sydney and got married in 1928, two arrangements that have lasted till the present day. When, in 1929, Tom answered a newspaper ad for a rigger on the Harbour Bridge, he was startled to find himself interviewed by Dorman Long’s Director of Construction, Lawrence Ennis himself. Ennis questioned him closely about working conditions in New York, and then sent for Hipwell, his Chief of Steel Erection. Tom started work straight away, and soon found himself in the middle of a union dispute. An Iron-workers stop-work meeting was called and he soon found that it was before his over two riggers who had been previously put off. Tom got up to say that he had been a union man all his life, and after much discussion the metting chaired by the Ironworkers Secretary Colin Tannock, accepted him and went back to work. Tom became the star witness for the Ironworkers at the Arbitration Court for the height and danger money loadings to the Award for all Bridge workers. Tom gave the crucial evidence on pay and conditions on coparable work in New York. At the hearings Dr Bradfield supported his evidence and Dorman Long stood aside, since by contract, the Government had to pay any wage increases. “Ben Tucker was the charge hand, he was talking to the crane driver all the time on the telephone. The crane driver was Big Wilkie, Vic Wilkinson, a New Zealander. He was good, you could trust him with your life. Then there was Jack Benson, who was a Swede we used to call Tarzan, and Max Linder, known as Moses and Sam Johnson both Poms. George Killen an Australian born and me, and the Canadian, Felix Faulkner, who was killed. That was a shame. It was bad luck I suppose. This plate slipped down and happened to hit him. He was not far away from me. He was laughing at us doing all the work putting the troughings down for the deck under the roadway. While he just had to signal the crane driver. The plate just happened to hit poor old Felix. He was bleeding all over the place and the first-aid man who was an ironworker, was trying to stop the blood; but by the time we got him down and to hospital it was too late. I went to give blood but it was too late. Tom finished up on the Bridge in 1932 and could find no work. He shipped out again for America but it was worse there. When he arrived back in Australia he got a gardener’s job at Richmond Air Base while waiting for work on maintenance on the Bridge. He tried to get back into the Air Force for World War II, but planes were no longer made of canvas, wood and wire, and at age 48 he was considered too old. Tom stayed on the Bridge until he retirement, a total of 25 years, when he put his age back to get a job cleaning aircraft engines for Qantas until he was 70. That was 21 years ago, and now at age 91, he lives quietly with his wife of 54 years, who chivied him into talking on tape for this article. The Harry Tomrops of this world are the unsung heroes of our, or any age, without their skills and daring, advanced designs can never be built. It’s an incredible story by today’s standards where we have so many conveiniences. We forget the hardships of “yesteryear” and what went before us. It’s been along time since I have thought of Henry so I am glad you have published this article. I remember the visits we had to our great grandparents. Henry in his shed, carving away at model ships telling me I should join the Air force and our Great Gran cooking up a storm for lunch. We never went hungry! I also remember being given clothes for Xmas and being disappointed! No one likes clothes for Xmas! But I do remember some silk button up shirts they gave us one year and feeling like I was king of the world in it! I know Mum used to buy the clothes to give us but I think Great Gran bought those silk shirts! I also remember always being told there maybe some change in the jar for us boys Sorry Jen, you were a bit young! There was also the infamous moment Dad talked me into skate boading down our Granparents very steep hill! I remember being with Mum when she got the call Henry had passed away and thinking, even as a young tike (about 11), it was the passing of a different time. As I said, thanks Bro for publishing this! Fur sure Big Brother, I have been meaning to post this for some time. Even this brief recount of his life is an amazing testament to the man he was… I’m sure there is so much more he had done, where did he find the time? You read stories like these, and you know the man and you realise that there MUST be people out there like Indiana Jones… having a lot of adventure. Next step is to get the old photo album from Mum’s and scan all the old photos from way back when. Even better, research more and write a book. Books been written about alot more boring people. Hi, I need to contact a relative of Harry … it’s a long story but the Tomrop family have a photograph from the bridge days and a fellow worker’s daughter is requesting a copy (her dad was killed). I have been doing research on my family and Harry (Ernest) Tomrop is the brother of my grandfather, Charles (Tom) Tomrop, who came to the US in the 1900s. Would love any additional info as Harry’s niece, my mother Helen Tomrop Linn, is the last in their family and had met Uncle Ernest in NYC early on. Im just writing to say that Harry (Ernest) is my great grandfather.. we have only got the newspaper article and 1 picture of people on the bridge…. it would be wonderful to hear from other people related! Diane, I wonder if I know any more about your Grandfather (Charles Tomrop) than your mom has already told you… My aunt, his second wife (Violet Helen Turner Tomrop) told me as much as she knew about his childhood in Latvia, etc. I remember he could speak or understand 17 languages! I know Uncle Tom and Aunt Nellie would have been thrilled to think he could trace his ancestry and family online.